Progress Theatre is a self-governing, self-funding theatre group founded in 1946, producing its first shows in 1947. It is governed and maintained by volunteers. The theatre building is on The Mount, Reading. As a registered charity, we are committed to promoting education in the performing arts as well as producing a programme of varied, interesting and challenging drama to the highest standard. Our intimate 96 seat venue has a fully licensed bar and is the oldest producing theatre in Reading. There is wheelchair access to the Theatre with a seat for disabled patrons and their carer, as well as a recently-installed hearing loop. Progress has a thriving Youth Theatre, a Writers' Group, the Friends of Progress and the members themselves. Progress Theatre enjoys good relations with the Arts and Leisure department of Reading Borough Council including working with them to stage the Reading Abbey Ruins Open Air Shakespeare in partnership with RBC each summer. We are members of the Little Theatre Guild (LTG) and the National Operatic and Dramatic Association (NODA) and we are a registered in England as a charity (no. 205440). We are not called "Prospect Theatre". 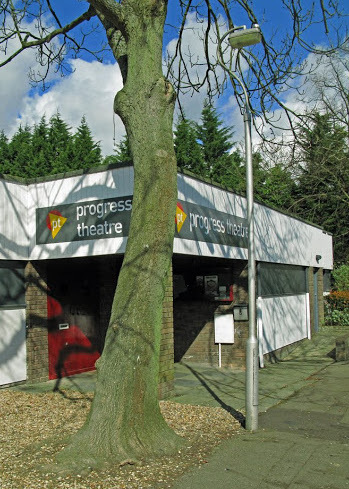 Progress Theatre was established in 1946 by a young, enthusiastic and forward-looking group of Reading people as a voluntary theatre group in Reading to present new and challenging productions. The first production was staged in 1947 and for five years performances were in Palmer Hall, West Street. The Mildmay Hall in The Mount was found to be available for rent from the Co-operative Society who agreed to its use as a theatre. The members, together with families and friends, converted it into a working theatre and the first production was in October 1951. In 1963/64 after a massive Fund Raising campaign, the Freehold of the building was bought (thanks to a fair selling price from the Co-op). The basis of the present foyer was built at that time together with other, then modern, facilities. With other alterations and extensions over the years, productions are still staged in the same building: it now seats 96 people and includes Disabled Access and a state of the art hearing loop.